The common chicken, Gallus gallus, is an important domestic species that touches many of our lives on a daily basis. Countless millions of chicken eggs and meat products are consumed by humans every year, and many other poultry products are used in everything from apparel to the arts. The chicken is also an important scientific and biomedical research organism. The development of chicken embryos has played an especially distinguished role in embryology, where the chicken is a model system used by researchers who study many different topics, and it is among the most common of laboratory animals in comparative anatomy courses. Click on the image below to view an animation of the development of the chicken embryo from day 12 to day 20 (10mb). In these visualizations, serial section movies of the eggs include the eggshell, while in separate 3D reconstructions built from the CT slices, the eggshell was digitally removed to offer a glimpse of the developing skeleton as situated inside the egg. CT imagery of a total of nine stages is available on DigiMorph.org. There is also an adult skull. Chicken eggs typically develop for 21 days before the chicks break free of their eggshells and hatch. The first of the scanned eggs presented here (day 12) is almost two-thirds of the way through development, but it nevertheless represents an early stage in growth of the embryo and its skeleton. At this time, the embryo fills only about one-third of the egg’s volume, and the skeleton has just become well enough ossified to be visible to X-rays. However, the brain and eyes have already grown relatively very large, and the bones of the skull provide little more than a delicate armature around them. 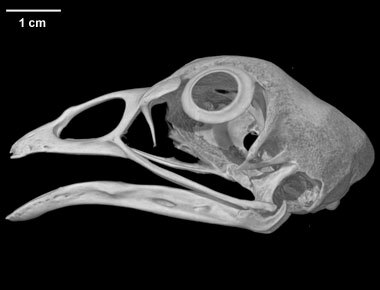 The bones of the beak and lower jaw are more robust. The vertebral column and ribs and the shafts of the bones forming the limbs have also begun to ossify. The more mature skeleton (day 20) is that of a much larger bird, one that fills the egg and is ready to hatch. The brain and its sensory capsules are largely surrounded by bone, and the skeleton of the eyeball, known as sclerotic ossicles, has begun to ossify. The beak is quite robust and is by this time strong enough to break the eggshell and release the chick. The vertebral column and ribs are also well ossified, as are the limbs. Once hatched, the skeleton of this chick would continue to grow and mature for several months. This specimen was purchased from Ward's Scientific. It was made available to The University of Texas High-Resolution X-ray CT Facility for scanning by Dr. Betsy Dumont of The University of Massachusetts Amherst. Funding for scanning and image processing was provided by Dr. Dumont. This specimen was scanned by Matthew Colbert on 17 July 2008 along the coronal axis for a total of 814 slices. Each 512x512 pixel slice is 0.083 mm thick, with an interslice spacing of 0.083 mm and a field of reconstruction of 39 mm. Bellairs, R., and M. Osmond. 1998. The Atlas of Chick Development. Academic Press, San Diego, 323 pp. Chamberlain, F. W. 1943. 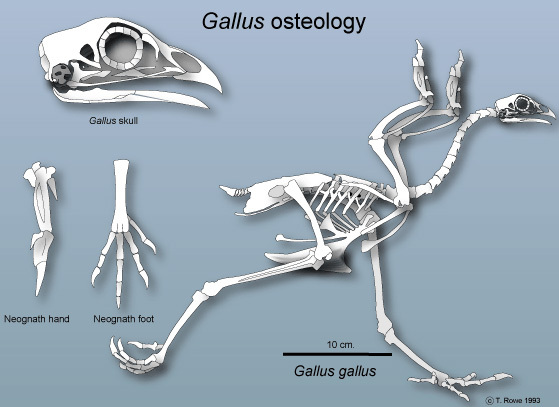 Atlas of avian anatomy: osteology, arthrology, myology. Michigan State College Memoir, Bulletin 5. 213 pp. Hamburger, V., and H. Hamilton. 1951. A series of normal stages in the development of the chick embryo. Journal of Morphology 88:49-92. Jollie, M. T. 1957. The head skeleton of the chicken and remarks on the anatomy of this region in other birds. Journal of Morphology 100:389-436. Lillie, F. R. 1952. 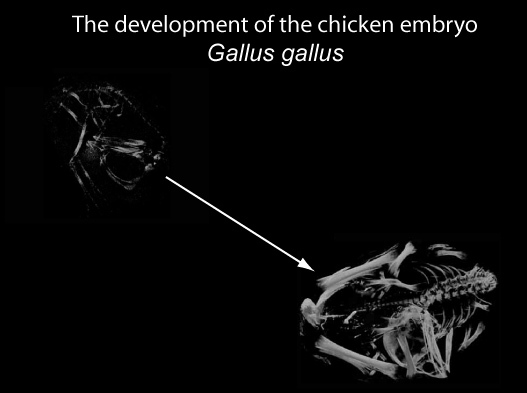 Development of the Chick: An Introduction to Embryology. Holt, New York, 624 pp. To cite this page: Dr. Timothy Rowe, 2011, "Gallus gallus" (On-line), Digital Morphology. Accessed April 25, 2019 at http://digimorph.org/specimens/Gallus_gallus/adult/.